9/47 Amanda Jones Very obviously aspired to greatness, but fell just short of its aims. Not quite clever enough. 10/200 Max Braden A darkly funny drama with some great dialogue and characters. 18/159 David Mumpower Ridiculously witty movie borders on being too sleek for its own good, but pulls it off with grrrreat performances. 22/65 Kim Hollis Super smart, funny and cleverly crafted. 28/68 Michael Bentley It's a smart, funny, and even warm-hearted look at lobbyists, but not quite as biting as it should have been. 30/52 Les Winan Well made and entertaining. I was expecting something a bit more scathing. A film almost too proud of itself for being clever. 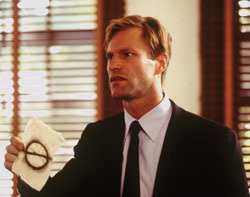 Based on the novel by Christopher Buckley, this dark, satirical comedy will star Aaron Eckhart as Nick Naylor, the chief spokesman for the Academy of Tobacco Studies. As the industry's chief spokesman, he's been called names such as "Gucci Goebbels", "Yuppie Mephistopheles" and "Death Merchant". He argues against the puritanical anti-smoking trends, a controversial position that earns him guest spots on Larry King Live and the opportunity to be the heir to the granddaddy of Winston-Salem. He's also been the recipient of numerous death threats. His job as mouthpiece for the tobacco industry causes serious problems on the home front, however. Nick is trying to be a role model for his 12-year-old son, but it's hard to do that when you're espousing things you might not completely believe. See the latest developments for this project on the Thank You for Smoking Movie News page.